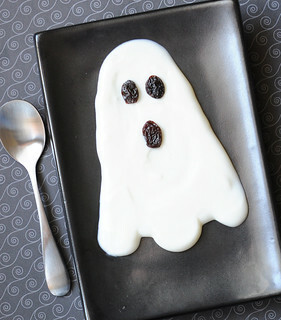 Snack time just doesn't get any easier than this spooky treat—and it's healthy, too! This is quite possibly the easiest cute food you will ever make your kiddos! It requires nothing more than two ingredients and only takes about one minute to whip together. Can’t beat that! Despite being so easy to make, though, it’s pretty cute—or should I say spooky. The kids just loved this and scooped up every single bite. They even asked for seconds. Because it’s so easy to make, I happily obliged. It’s definitely a regular Halloween snack in my household. 1. On a plate (not a white one! ), spoon out some vanilla yogurt. Using the back of your spoon, spread it around until it’s in a ghost shape. 2. Add 3 raisins for the ghost’s eyes and mouth. Easy and done! Have fun making this spooky Halloween snack for your kiddos! They will love it for sure.